I’m going to have a suit made soon. Naturally I’m considering what I’d like to have. Not suffering the burden of excessive wealth this is a rare happening, so some care must be taken with the selection of style and cloth. Now, there are two schools of thought on this issue. These can be defined as my school, and everybody else’s. Everybody else, probably wisely, argue that if you’re going to invest in bespoke or made to measure tailoring then get the basics sorted first. Those keystones of your wardrobe, the blue and the grey suit in classic styles, are by far the most versatile options, and you can always build in more interesting elements later. Sound fatherly advice. My theory goes something like this; working one to one with a tailor opens up a world of possibility that the high street just can’t match. Why not have something a bit special, a bit different, something you’ve always wanted but which the high street isn’t offering. Keystone suits will be worn regularly and wear out, unless supplemented with high street offerings. In which case what’s the point? First up, a suit I wrote about some posts ago. Referred to as the Kent style it wasn’t popular judging by the comments. But I’ve seen one or two more and I really like them. But as the previous article made clear, you can’t afford to buy this off the peg. 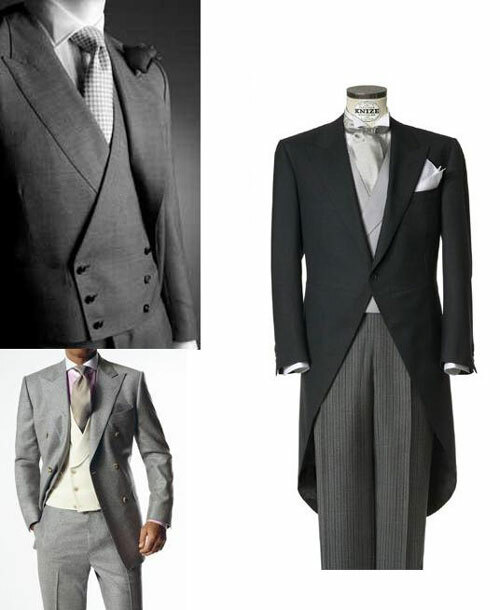 The single breasted peak lapel suit with a double breasted waistcoat. The fact that I couldn’t find an exact picture of what I want is the reason I’m considering getting one made. The pictures give a rough idea of the aesthetic I’m searching for, the lovely sharp lines and series of V’s. One to be done in a navy worsted cloth I think. A large box check, ever so slightly reminiscent of Victorian dandies. 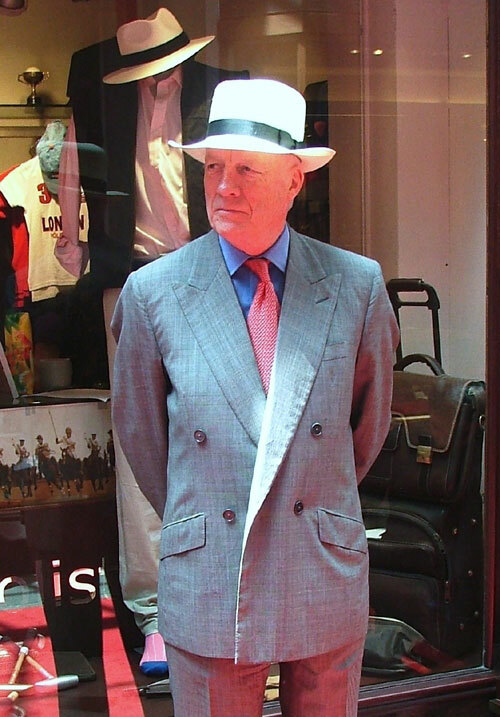 Popular with the Duke of Windsor, here in the UK it went through a bit of a revival 10 years ago and was done to death. An ideal candidate for revival. A subject I have written about ad nauseum, I continue my love affair with patch pockets. I’m toying with both the single breasted and a double breasted option. Interesting scoop by fellow columnist Simon Crompton here, shows I’m not alone in my thinking. I have it mind to go for Navy needle cord or grey flannel for the double breasted option. Alternatively, something similar to this. But I want to see the cloth books. 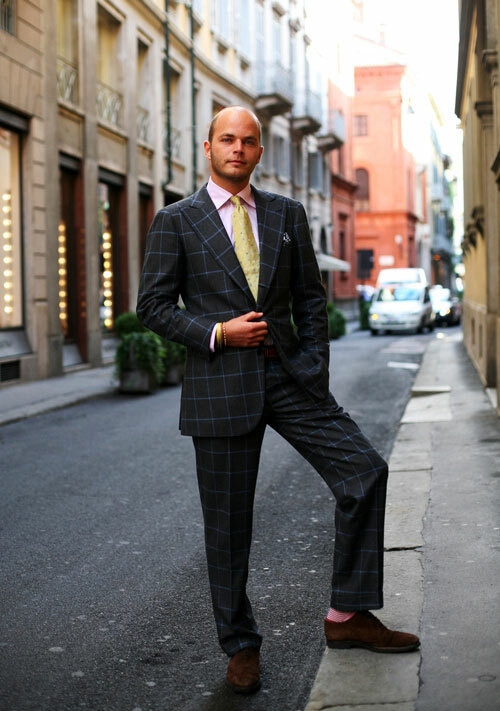 My most recent choice at the tailor was a chalkstripe flannel with peaked lapels and a double-breasted waistcoat with contrasting horn buttons. I think this combination is rare, elegant and consequently worth doing. I do love patch pockets although it always depends on the material and the Kent option, since you brought it up, has always intrigued me but I would go for a combination of the box check and the peaked lapel/double-breasted waistcoat. I hope we will get to see pictures of the suit. I’d forgotten about the possibility of contrast buttons. This article echoes my own interest in commissioning a three-piece with a double-breasted weskit or a windowpane checked suit. 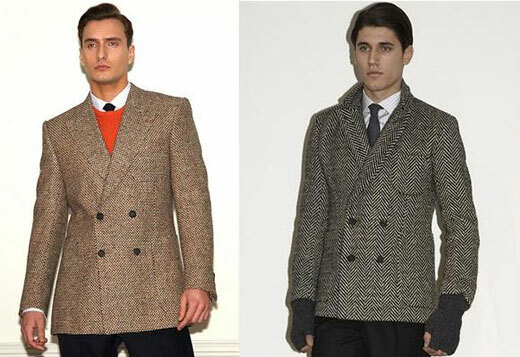 On a matter of personal taste, I think the DB waiscoats shown here work very well, but even the headless “morning suitor” shown highlights the problem with DB jackets, i.e. they must always be worn buttoned up. The approach to only do up the inner button in the jacket looks messy, in my view. (But the photograph makes the wearer more “portly” purely by reflecting a camera flash off the belly). I really think that you’ve hit the nail on the head. If you are going to splash out do it in style with something individual.